Daytona Day is only 24 days away. And with the Great American Race that close, it’s time to recognize one the greatest drivers in the history of the sport, Jeff Gordon, who will be in the television booth with Mike Joy and Darrell Waltrip for the Daytona 500, Feb. 26 at 2 p.m. ET on FOX. Gordon’s record at Daytona International Speedway was stellar. In 46 starts there, Gordon won six races and had 13 top-five and 21 top-10 finishes. To put that into context, the only two NASCAR Premier Series tracks where Gordon won more often than he did at Daytona were Martinsville Speedway, where he won nine times, and Darlington Raceway (seven wins). From the very beginning, Gordon was stout at Daytona. He finished fifth as a rookie in the 1993 Daytona 500 and won the July Daytona race in ’95. Of his six Daytona victories, three came in the 500 and three came in the second Daytona race of the season. 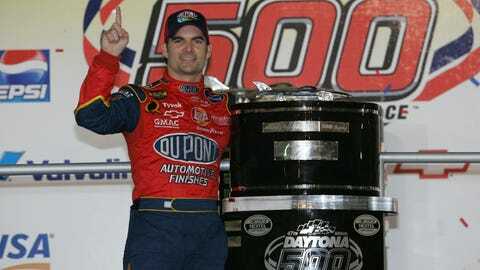 Gordon’s most dramatic Daytona 500 victory may have been in 1997, when he led Hendrick Motorsports teammates Terry Labonte and Ricky Craven to a 1-2-3 finish soon after team owner Rick Hendrick had been diagnosed with chronic myelogenous leukemia. For his entire career, Gordon won 93 NASCAR Premier Series races, which ranks him third all-time behind Richard Petty and David Pearson. His four series championships were bettered only by Petty, the late Dale Earnhardt, and Gordon’s former teammate, Jimmie Johnson, all of whom are tied with seven titles each. Gordon also holds the Cup Series record for consecutive starts with 797 and set another record by winning at least one pole in 23 consecutive seasons.